Eyes are what bring your amigurumi doll or animal an expression. There are a number of options for great looking eyes – here is our take on some of them! This type of eyes can add a “professional touch” to your amigurumi doll or animal. They are easy to insert and usually survive a trip or two to the washing machine. Unfortunately, plastic craft eyes are not recommended for children under three years of age as they can easily come out of the fabric when chewed on. Sewing buttons on your amigurumi can be a great alternative to plastic craft eyes and can give great looking eyes. However, just as the plastic eyes, they can easily come out of the fabric when chewed on. Felt eyes can be a good option as they are baby-safe if properly sewn on. You an easily mix and match different colors to make the eyes “more interesting”. This is by far our favorite technique. They are quick and easy to do and your probably already have the yarn! 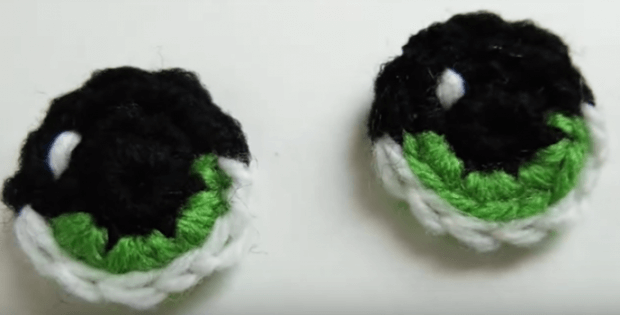 Here is a tutorial on how to easily crochet eyes for you amigurumi projects. In the demonstration, worsted weight is used and the eyes are about an inch across. If you would like to have smaller eyes, you can just use a thinner yarn. If you are looking for a project to try out the crocheted eyes on, why not make one of the little bears that is featured in one of our other articles. You can find the FREE pattern here: Amigurumi Bears.